In the summer of 2012, I started my post-collegiate career in a three-year engineering program at a top aircraft engine supplier. I had the opportunity to work on incredibly exciting technology and was finally able to apply what I had learned in school in a real, tangible way. As part of the program, I rotated to a new role every 12 months while also working on my Master's in Mechanical Engineering. The schedule was grueling, and at times I had 20 hours of homework on top of a 40+ hour work week. By the end of the second year, I was extremely stressed, barely sleeping, and had abandoned my once-healthy diet. Between my job responsibilities and schoolwork, I spent many long hours seated at a desk, resulting in hip and back pain that made it difficult to do just about anything (run, walk, sleep, sit, stand, drive, etc). Eventually, I developed piriformis syndrome, an uncommon neuro-muscular disorder that puts pressure on the sciatic nerve. I saw a physical therapist who suggested that I try yoga to loosen up the painful tension in my hip. Determined to find relief, I started practicing regularly at a local yoga studio. 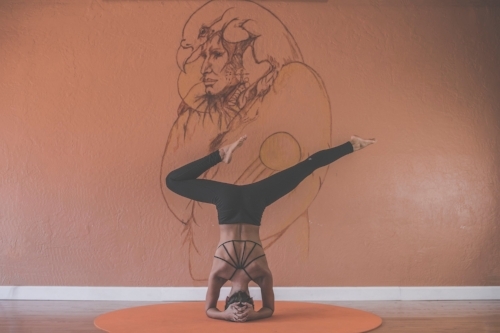 My hip muscles were so tight that some poses were nearly impossible, but as I continued to practice, I gradually found myself stronger, more flexible, less stressed, and nearly pain-free. I even started to practice yoga in my apartment on days that I couldn’t make it into class. I once mentioned off-hand to my roommate that I could probably teach a yoga class on my own after practicing so much. She then planted the side-hustle-seed with a simple question: "Why don't you get certified to be an instructor?” My immediate reaction was to come up with a slew of reasons of why I couldn't — too expensive, not enough time, not enough experience, public speaking terrifies me, etc. After much internal debate and some incredible encouragement from friends and family, I decided to invest in myself. I found a local studio that offered an accredited 200-hour yoga teacher training that was held every other weekend over an eight-month period. I was both surprised and thrilled to find a program that didn’t conflict with my engineering job and school schedule. Teacher training forced me out of my comfort zone in ways I didn’t know were possible, and I came to realize that there was no fool-proof formula to effectively teach a class. I had all the tools, background information, and examples for how to teach and practice yoga - but ultimately, I had to find my own voice to share with students. In my quest to do so, I started speaking my class plans out loud during my commutes to work and while practicing yoga by myself. Initially, I felt embarrassed to hear my own voice even when I was alone in my car, thinking, How could I teach a class if I was uncomfortable with no one there? Even the thought of commanding a room of expectant yogis made my heart race and my palms sweaty. Apart from getting over my fear of teaching, one of my other concerns walking into the training sessions was that I would earn a certificate and never find an opportunity to use it. So, I made it my business to jump at any prospective gig, even if I didn’t think I was 100% qualified. I saw a flyer seeking hot yoga instructors (after attending all of one hot yoga class in my life) and emailed the owner saying I would be certified in a couple months and was interested in teaching at her studio. Not expecting to hear back, I knew I had nothing to lose by reaching out. Within a couple of days, the owner responded, asking if I would like to be on the substitute teacher list since there were no open classes. I agreed without even setting foot inside the studio and subbed for every class I could without burning myself out. Within a couple of months, I earned myself a regular time-slot. I didn't turn into some super-confident blissed-out yoga instructor overnight. I wanted to instruct each class perfectly, so anything that went awry sent my internal panic alarms off. I had students come to class late, and students who packed up their mats and left before class was over. I forgot or mispronounced the names of poses, and I once got so flustered that I truly could not tell the difference between my left and right. After each class, though, a handful of students would always come up to thank me, or to comment on something they liked about the class. I learned that didn’t need to be perfect - I needed to be unscripted and real. Today, I continue to teach once or twice a week and even help with the teacher training where I received my certificate. Are there still days where I feel insecure about teaching yoga? Yes. Are there days when my playlist and sequencing are on point and I feel like a rock star? Also yes. My side-hustle has made me a more confident speaker, which has helped me in the yoga studio and in my career as an engineer. I have become kinder to myself, which in turn allows me more kindness to share with others. I have met interesting, brave and talented people that I would never have met otherwise. I also find that I take the time to pause and breathe and relax more often... even when I’m not on my mat. Audrey Keene is a mechanical engineer and yoga teacher in Cincinnati, OH. She loves to learn and pass her knowledge on to others both in the office and the studio. A lover of productivity, she starts each day with a cup of black coffee and a to-do list (even on the weekends). In her free time, Audrey dabbles in various activities including distance running, reading non-fiction, rock climbing and enjoying a good beer.